Sandra Bland video update: Texas authorities replace choppy video with version free of "technical issues"
Video released by the Texas Department of Public Safety shows Trooper Brian Encinia attempting to pull Sandra Bland out of her car on July 10, 2015. Update, 6:00 p.m.: The Texas Department of Public Safety contacted Slate Wednesday afternoon to pass along dashcam footage of Sandra Bland’s arrest that is not afflicted by the technical issue that caused people and vehicles to seemingly appear and disappear at random in the version originally released to the public. The video has not been edited. To eliminate any concerns as to the efficacy of the video DPS previously requested the FBI examine the dash cam and jail video to ensure the integrity of the video. The entire video was uploaded to include the audio and video of the conversation the trooper had by telephone with his sergeant, which occurred after the arrest. Some of the video during this conversation was affected in the upload and is being addressed. We are working to repost the dash cam video. 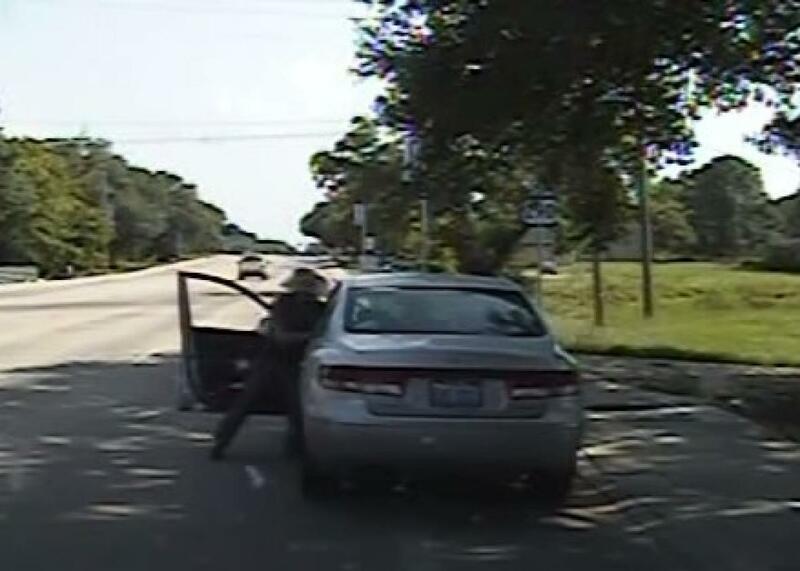 Original post, 9:06 a.m.: A few questions were answered and many new ones were raised with the release late Tuesday of dashcam footage of Sandra Bland’s arrest in Texas on July 10. As the video, which runs nearly an hour, circulated online, some public officials in Texas questioned whether Bland, who days later died in a Texas jail, had commited any crime that warranted arrest. In addition to criticism of Trooper Brian Encinia’s conduct, which the director of the Department of Public Safety admitted Tuesday violated protocols, the state of Texas is now facing scrutiny over possible problems with the video’s continuity. Independent journalist Ben Norton appears to have been the first person to lay out out apparent irregularities in the dashcam footage from Trooper Encinia’s squad car released by the Texas Department of Public Safety, focusing on the portion of the video shot after Bland was handcuffed and placed in another officer’s vehicle. While Trooper Encinia, off-camera, speaks on the phone to an unidentified party, the camera shows a tow truck preparing to remove Bland’s car. There are several points when the tow truck driver and passing vehicles either flicker in and out of view or show up more than once, giving the appearance of choppy editing, alteration, or a glitch, while the audio seems to run continuously. A spokesman for the Department of Public Safety told NBC News late Tuesday that he would “have to check in the morning” to confirm whether the original recording from Trooper Encinia’s car matched the video posted to YouTube by DPS. The video was reportedly screened for a group of state political and public safety leaders before it was released, and the Texas Tribune reports that two state lawmakers who viewed it said it showed Bland should not have been arrested. “I think that once you see what occurred, you will probably agree with me she did not deserve to be placed in custody,” said state Sen. Royce West, D-Dallas. West and Giddings were among about a dozen state leaders including Texas DPS Director Steve McCraw and Lt. Gov. Dan Patrick who met with Waller County Sheriff Glenn Smith, District Attorney Elton Mathis and other members of the local community to review the long-awaited dash cam video that recorded Trooper Brian Encinia arresting Bland on July 10. *Correction, July 22, 2015: This post originally stated that Trooper Brian Encinia is on administrative leave. He is on administrative duty.